Superb!, with excellent feeling, a sensitive & effective anti-dive and OE springs inside tolerances, that with 24 years of riding on it, left me stunned for its excellent quality. I've changing the fork oil with semi-synthetic 10-40 w engine oil, heavier that the 10w recommended one. I've finished with the anti-dive dialled on position 1 of 4, and hydraulic knob on 2nd position and with no air on forks. Honda recommends 6 psi max. air pressure into the fork spring, that it is very few and you need a special (and expensive) pump to check it. Mine is an excellent PROGRESSIVE. The fork must be pressurized with no weight onto the front wheel, like the VF 500, VF 750, VF 1000 and first CBR 600 and VFR 750 series. If not, the oil seals are prone to leak. Anyway is too little pressure to feel any effect at all. If you need harder spring, use the CBR 600 90-92 fork spring spacers, cutting them longer than the CBX ones. You can't vary the bike geometry sliding the fork tubes up or down at the yokes because the fork stanchions are drilled & joined for a pressure balancer below the top yoke. ´The forks fit only in 1 position, without any other possibility. I've installed fork protectors, very useful to avoid marks from the road debris on the stanchions and also protects your fork seals. The only precaution to dismantle the legs is to be careful with the 2 clips on each leg that hold the leg in place, because you could break them, 1 on the top of the handlebar and 1 down the air/oil compensator. I painted the fork caps, the brake callipers spacers and the horns at the same time. Like the legs are different, I describe the work separately for each leg. Right leg: to extract the hydraulic rod is easy: simply extract the Allen screw at the inner down fork vase. The drain oil bolt actuates like a stopper. After this , the rest is a doddle: extract the clip that holds the oil seal in place, just down the dust seal, and dismantle everything. To reinstall the leg I was advised by Dennis, team RC17 member, not to use the drain bolt like a stopper: the lock piece can rotate, damaging the bolt ,and itself, and if you then try to remove the bolt the head may shear off, necessitating either drilling out the remains or replacing the fork slider. So I used a Suzuki special tool to hold the hydraulic rod in place, that you can see in the pic. I used a special tool too to fit the new seal, watch it in the photo. Use 375 cc. SAE 10 w oil, because everything is new and you don't need ticker oil to compensate the worn bushes and ready. Left leg (antidive): to extract the Allen screw that holds the hydraulic rod in place you need special tools: or a pneumatic gun or the Suzuki special tool, because the method described on the Honda workshop manual (spring in place to pressure the rod) it doesn't work: the rod rotates inside the slider. The rest is the same procedure of the other leg. I have not dismounted the antidive unit because it is mechanical and it works perfectly. I only changed the part where the brake calliper activates the antidive because it was seized. I refitted the hydraulic the same mod as before. 400 cc. SAE 10w and work done. November 2.013: As mentioned at the beginning, the original fork is going well and springs tolerances are maintained in spite of the time and the miles, but I found a great deal Hagon springs and bought these. I really did because I'm considering a rims change, and to compensate for the lower rear height I need or change the fork or move legs up 1 cm., but without suppressing the air regulation is impossible, and you lose all kinds of regulation at fork, except playing with amount of oil or fitting spacers. When I went to install, thought let oil SAE 10 w fork because it had less than 5,000 kms. since its renovation, but it was quite weathered, dark mercury colored and also it left a smear metal species in the basin where it emptied. HORRIBLE!. Once again it confirms what I write on FJ suspension section: fork oils are BAD oils without additives and motor oil is much better and resists more than any expensive fork oil. So I fitted the springs, put 25 cc. less 10-40 engine oil in each bar than OE specified, as in my FJ, leave the minimum hydraulic and antidive settings and air to zero pressure. Hagon recommends 140 mm. gap as a measure of amount of oil, but I wanted to make a test on the next day to see how the fork behaved prior to disassembly the forks or the wheel in order of take the correct measure. Like I said, early in the morning, full leathers, air pump in the tank bag and going to take a ride. From the first moment, only driving out of the garage and down the curb, the bike absorbs bumps much better. I got a very bumpy road to begin with and the fork feels much more absorbing, reacting gently to the asphalt imperfections. But when the speed increases do not feel soft but absorbent, and rigid when braking. AWESOME. When on the same tight road with multiple U blind bends the tarmac get better, the bike don't sink when braking hard, and the brake itself feel much more powerful. You can brake while turning the bike while gently apply the rear brake without any hesitation or nothing else than pure confidence with perfect aplomb . In addition the fork don't extent due to the air pressure on accelerations and on fast roads the bike is perfectly firm and stable and feels nothing special riding to jail speed levels. The feeling is that not only is another fork: it is as if the shock was harder spring and more responsible hydraulic, the chassis had been reinforced, brakes improved ... : ABSOLUTELY AMAZING!. And we're talking about a bike that my acquaintances were amazed at how stable and how well it was riding, which is even more surprising result. And all with the minimum settings ad without air pressure. I had not to touch or change the amount of oil to get home. You need the same pump as the front fork to put pressure on the shock. Weighing around 80 kg wearing full equipment, I carry on 34 - 36 psi. You can change the rear damping force with a knob at the right side of the bike. The control cable is exposed to the elements and it is very usual that is rock-solid, like mine. Or that it is broken, like in my 2nd hand bought shock. When I dismantled the rear end of the bike, I observed a knob at the top of the shock with 3 positions on them, that is cable -engaged at the dial-knob. I positioned mine in the 3rd position, hardest available, and I've left it there because there is a substantial increment between both positions. I thought that the rear shock was shot in a 24 year old bike, thinking about to dismount to repair it, but the shock is in excellent nick. Good done , Mr Honda!. The procedure is relatively simply. The only laborious work is to remove the shock, only because it's a dirty and time consuming amount of labour. With the sock out, hold it upside down in a work bench, remove the Schrad valve with a 10 & 12 spanners (the valve through you charge air pressure in the shock) and extract the old oil with a 60 ml syringe, whose end happened to be exactly the correct size to screw into the hose after the valve was removed. 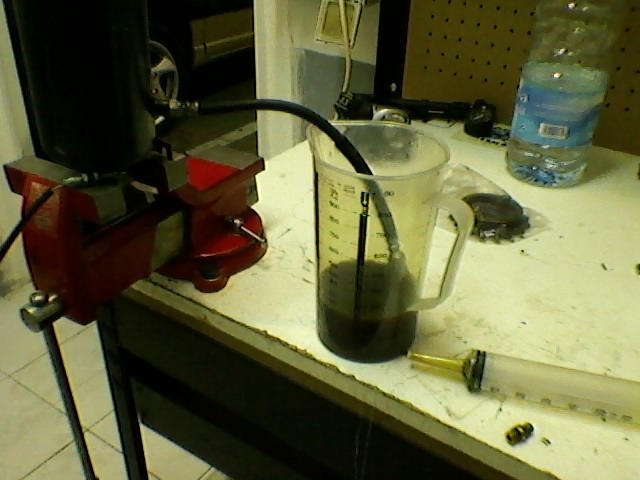 A couple of pumps of air were enough to encourage the fluid to come out quickly into the syringe. I extracted 300 cc. To fill I set up the shock vertically with the hose at the top and used the syringe to inject 15-30 w fork oil, ticker than the OE 10 w recommended by the Honda manual – much quicker than waiting for it to drain in under gravity. You could refit the shock at the bike and refill there the shock, with the bike on the centre stand. Refit the valve and re-pressurize the unit. Presto!. Now the damping is stronger due to the ticker oil and it maintains better, the damping with heat, when used hard. You can feel the bike more planted at high speed too. April 2012: I've changed the swing arm bearings, so I dismounted the dogbones and greased everything again. So like the shock was out, I change the oil again. The Repsol 15-30w fork oil was completely black and degraded to my surprise. So, today I've been informed that fork oils are simply cheap engine oils with less additives because support less effort, I've used 100% synthetic Mobil 1 5-50w engine oil (Carrefour, in fact, it is Mobil 1 in another bottle). In fact Yamaha recommend engine oil for the Yamaha FJ 1100 fork, and my friend Jose Carlos and myself have been using 10-40w engine oil in our FJ 1200 3CV front fork with fantastic results, extracting the oil completely new after 12.000 kms. On a lovely Sunday morning, the ambient temperature may be 21C (70F). Motorcycle forks will run in the 26C (78F) temp range, rear shocks will run in the 65C (150F) range and rear reservoirs will be around 43C (110F). While motorcycle rear shocks require very high viscosity index to function well over such a huge temperature range, motorcycle forks and bicycles do not. The first feeling is more damping force. Even although with the 15-30w oil my shock was dialled at maximum damping. It is not necessary now . And not only you feel more damping force, you feel better damping, with more progressive action in any circumstance. December 2.015: like with the first OE shock in 2012, the rear shock progressively felt harder until the point that when completely compressed only for being sit on the bike, it delays like 30 s. recovering its full extension. Completely solid on run. Its indifferent about trying different viscosity oils, and with even no oil or uneven air pressure; it stay solid down compressed. In 2012 I bought a 2nd-hand shock and It has been working for 3 years perfectly. I tried to repair the previous shock, but I cant find any professional service that overhauled. No one wanted to repair it. And looking for info at Internet I couldn't find any. Being very surprised and intrigued about why nobody repair these shocks and being the fortunate owner of 2 OE shocks :( I decided to try overhauling the shock myself. Likewise this info is useful too for Honda VF 500, VF 750, VF 1000, VF 1100 series, and CBR 600 and VFR 750 first years models owners with the same construction shock, and maybe for Kawasaki GPZ 900, GPZ 1000 RX, GPZ 600 owners and another bikes with air assisted shocks. As always, click at the pictures to expand them. Picture 1: like you can see, the original oil ring can be purchased easily from your Honda dealer. At the left side the new pro-link dust seals. Picture 2: as the Honda workshop manual describe, the shock is settled in a hydraulic press to extract all the oil and the oil seal. The pressure blow up the upper carcass oil seal, splashing oil all around, even when the press is a manual type and I went slowly. Previously to extract the oil ring, there are a metallic circlip and a metallic washer that hold everything in position that must be extracted. At the picture it can been seen the plastic inner main bush and the oil ring. Picture 4: to extract the external carcass, the damper regulator wheel must be extracted first of all. The Honda manual don't specify how to dismount it. After a lot of thinking and turning the thing I discovered that the wheel is hold in place by a pressure pin that can be extracted with a pair of flat screwdrivers. Then the shock can be settled upside down in the hydraulic press to dismount the upper metallic and the upper oil seal, blown when extracted the oil. Picture 5: the inner bush, the oil seal, the flat metallic shim and the circlip can be observed in detail. Underneath the damper wheel and the pressure pin holder can be seen. Picture 6: external carcass dismounted. The inner spring and the main hydraulic rod are exposed. Picture 7: another problem: there is a play in the embedded metallic bush at the top of the oil damper inner bottle. It can be feel when the rod is moved up & down by hand. To solve this problem the bush must be changed, but the hydraulic bottle where the rod inserts is made on one piece and it is impossible without sawing it. Maybe it would be possible weld it again, but the bottle is made from thin aluminium and it must be welded perfectly straight. Note at the pic the original industrial weld. I tried to clean everything scrupulously, inserting even fuel manually by the bottle holes, but no debris was apparent. And the hydraulic rod feel was hard even at this state and without oil. Like the only way from here it was rebuild everything and refitted on the bike again, and clearly there is no more manoeuvre performed that a deep cleanup, being impossible changing the bottle inner bush, I decided to saw the hydraulic bottle completely to take a look inside if everything was in order because anyway I own another collapsed shock that could be made the same procedure that I was following if it was correct. Picture 8: nothing resist a radial saw. When opened the rod can be dismounted and inner hydraulic cartridge can be extracted to be disassembled and inspected. Picture 9: the hydraulic cartridge is tight lipped and the oil flow through a gravity pressure valve that it is inbuilt at the cartridge cap to let the oil flow when the rod move the inner cartridge piston up & down. So that it is meant that it is impossible to clean the cartridge from outside without removing the cartridge cap (that it is impossible without extraction the cartridge, impossible too without sawing the bottle). At this picture can be seen the inner cartridge valve disassembled form the main rod and it is already noted the granularity layer made of oil and plastic debris that explain the shock collapse. Picture 10: inner cartridge disassembled and inner piston cartridge exposed. The pic don't expose clearly the granularity plastic layer covering all around and inside all the components: inside the hydraulic valve, particles embedded in every little oil pass... Every part was impregnate of the plastic semi solid gel. In some cases the gel was solid inside oil passes (must be due to the shock working temperature) and even with an air compressor it was impossible to liberate those tiny oil holes. Picture 11: the granularity gel can be noted at the top of the inner hydraulic cartridge piston. Directly from new, I'm sure that a plastic shim stopper bump is fitted at the top of the inner cartridge piston to avoid that the cartridge piston metal surface was damaged with the movement and the continue impacts with the metal inner hydraulic cartridge top. With age this plastic stopper start to degrade and in a indeterminate moment it break and possibly part of the shim continue fitted, so resulted a little play when the shock wass compressed, giving place to the embedded metallic bush at the top of the oil damper inner bottle play. The parts of the shim continue suffering the age and mechanical degradation until all the material is reduced so enough little plastic particles that start getting into the oil passes and gradually blocking up. (From here my sensation of increasing compression damping for days until the shock collapsed). The shock collapses because with the oil passes were blocked and the vacuum force when the shock try to recover absorbing oil is so big due to not oil flowing inside. The one-piece hydraulic bottle and the cartridge valve cap make impossible a deep cleanup when a repair attempted. If not, with a new bump stopper (maybe a little spring to avoid future degradation) and a purposeful made new metallic inner bush, the shock could be restored to a better than new condition. So the shock can not be repaired. Not by me, anyway. Plus: a 2nd hand one is more than 20 years old by now on all CBX 750 and CBR, VF and VFR series, and the plastic shim stopper It will be in degradation process and sooner or later the hydraulic shock will collapse. SOLUTION: Shock Factory, Betor, YSS, Hagon, Nitron or Wilbers. But it is advised that a remote hydraulic preload adjuster is mandatory, so the replacement will be more expensive. With the free place available when the shock is mounted on the bike it is impossible to change the preload without extracting the shock from the bike with a nut preloaded shock. February 2.016: like the OE shock cant be repaired I started to look for a new aftermarket shock. Not considering Hagon due to the problems experimented in my FJ1200 (take a look at the Suspensions section) I chosen YSS, a good balance between price & quality, I think. I was informed that nor YSS, Hagon or Wilbers offer remote preload option for the CBX shock. It is due to the total short length of the shock: there is no space to fit a remote preload collar and an appropriate spring because the spring would be too short to be useful. Like you can see at the pics there is no possible access to the preload collar to regulate the preload. It is necessary to dismount the shock to make any dial, no very useful if occasionally the bike is riding with a passenger on. I only ride alone on this bike , so its not so much problem for me, apart of the initial dialling of the shock. But the original settings are simply perfect: I stated my weight to the YSS dealer with full equipment on, and with any touch, directly fitted from the box, the dynamic SAG is 35 mm. With 60 damping position, the pre-dialled setting is simply perfect too. The shock is way better that the OE shock, so much when hot, maintaining a constant level of damping, and giving a much better quality of ridding than the OE one.